Sometimes I find living in the midwest...well...boring, but every once when you least expect it (like when you have a little excursion through Cincinnati while between games for a boys soccer tournament) you stumble across something like this. 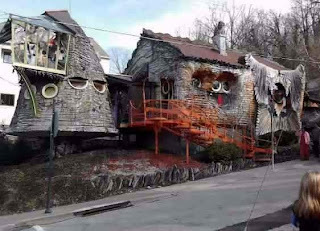 A most unusual house! 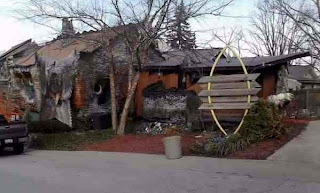 Bob said he believes it's owned by a University of Cincinnati professor who, from time to time, allows student architects to add a 'little more'. Sorry for the low resolution pics, camera phones can only do so much. 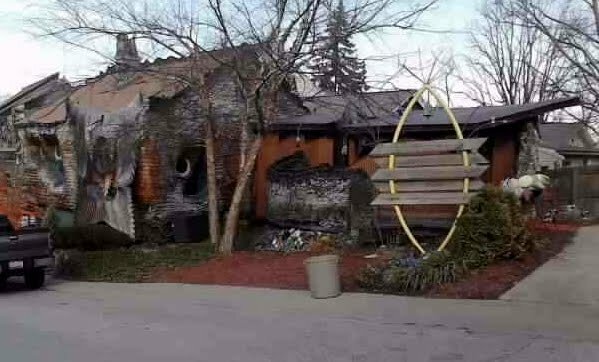 This house was beyond unique, beyond unusual, it had to be admired for being so 'out there' especially out here in the conservative midwest. I love how "out there" it is. Not that I'd want to live in it, but, it is good for conversation. That's amazing, never have seen anything like them! Would love to see inside, bet it is slanted! how extraordinaire, and how wonderfull to watch! thanks, and happy sunday,dear. Angie, you will have to tell me where this unique gem is. I would love to be able to see the inside. See you soon. Cool! In the little So. Cal. desert town we used to live in as kids, there was a property on the corner that was a bunch of kludged together train cars. Stacked on top of one another and every which-a-woo, with working stove pipes out of the top. We thought is was kooky, but fun! Just goes to show, home truly is where you hang your hat!